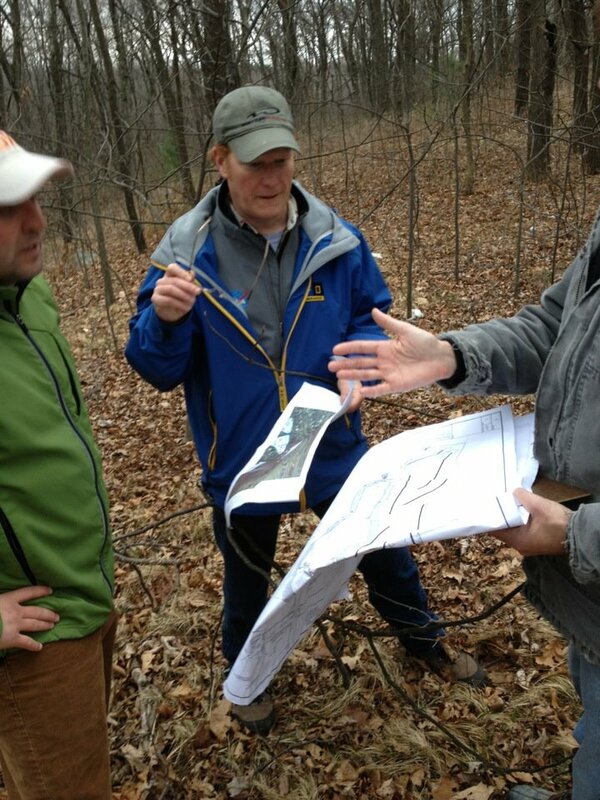 Bill Stewart and Brendan Callahan discuss location ideas for disc golf fairways. Notice the detailed topographical blueprint! As an official disclaimer, we must first say “Nothing is set in stone and/or guaranteed at this point in the project.” However, getting that out of the way- it’s exciting to learn that Peabody, MA could be the new home of a disc golf course! Kodak, or Eastman Geltine, or whatever it is called- had a factory in Peabody, Massachusetts and at one point in time owned a whole ton of land. They used millions and millions of gallons of water for their production which they apparently got from the streams of Peabody on the land they owned. Long story short- they’re no longer using this water, and if you watch the local news after a big rain storm, you’ve seen that downtown Peabody has a variety of flooding issues. The town has hired experts and civil engineers and is working to resolve the problem. As one of the many things the experts are aiming to do, there is going to be a catch basin installed on one of the plots of land that Eastman Geltine has sold to the town. Since the town of Peabody now owns the land, they wanted to do more with it than just dig a hole in the ground for emergency flooding- they want it to be a park as well. THIS is where disc golf comes into the plan. Brendan Callahan is a Senior Planner for the town of Peabody and works in Community Development and Planning. He is often involved with projects like storm water management or wetlands protection. However, in this instance he brought his personal experience with disc golf into the plan. Seeing what the unique plot of land looked like (it could not fit/support a soccer field for example), the suggestion of a disc golf course was the perfect scenario. This is where things get even better though- the development of the land is part of the big picture makeover that must happen. Because of this fact, and because the disc golf course is being suggested and implemented at the earliest level, much of the course can literally be built with town funding. It’s one in the same with the flood management project. So often with disc golf courses, it starts with an enthusiastic local resident, moves on to a group of people, and then every ounce of labor and money has to be scrapped for. This is actually a way communities are built within disc golf courses, so it’s not a bad thing at all- but when this part of the process is bypassed, it opens the doors for other great things; like quality, design, and flexibility. I got an e-mail from Bill Stewart, the course director at Pye Brook Disc Golf Park, a few weeks ago asking if I’d like to go on a walk through of the property with Brendan to get an idea for what they were thinking. I assumed two things: 1.) That I was coming along as a disc golf expert, to shed light on what a disc golfer thinks. 2.) That we were just checking things out and tossing around ideas. I was pretty much dead wrong on both accounts. Brendan has played disc golf for a few years, and is quite familiar with how things go on the average course. He arrived with an employee of a local engineering firm, with detailed civil engineering blue prints/plans that already had basic disc golf hole layouts on them! Imagine my surprise when I look over to see a blueprint, scroll-sized, piece of paper with topographical details showing proposed disc golf holes! The actual walk through was very helpful, as Stew had experience in the design at Pye Brook, so he helped facilitate a few important changes that would allow a full nine holes to be incorporated on the property safely. There’s still a long way to go on the project, and things aren’t going to happen overnight. However there is still great cause to be hopeful! If things go as planned, the town could even purchase more land along the same strip (it’s sort of a “green-way” that leads to the old Kodak factory) and put more disc golf holes in. In any case, if the course is installed as proposed, it will not only be a beautiful, responsible use of the land- it will act as a much needed centralized course for the North Shore of Boston. Pye Brook and Amesbury have a very loyal following of local players, but there isn’t much of a connection to the course in Burlington as of yet. This course in Peabody could literally foster a whole new group of players and help tie together four courses. Land in general is very hard to come by in eastern MA, and this is proven with the sheer number of disc golf courses in central and western MA in comparison. This opportunity is not only exciting, but important to a local development in the disc golf scene! Here’s hoping for good things, speedy schedules, hard workers, community support and banging chains! This entry was posted in Course Highlights and tagged course, disc, golf, ma, new, peabody, plan, proposed. Bookmark the permalink. talking with another DG’er today about this, we both mentioned another spot on the North Shore of MA that needs a course- the sports field complex in Magnolia/Gloucester. HUGE plot of land with all sorts of woods around the whole thing! ps I love the peabody course !